New Delhi: Almost half of the Winter session was washed out with the ninth consecutive day on Friday being lost to the din caused by the Opposition and two UPA constituents over their demand for a rollback of the decision to allow FDI in retail. ‘Down, Down, FDI’, ‘FDI Wapas Lo’ rent the air in both Lok Sabha and Rajya Sabha with Trinamool Congress and DMK members joining the Opposition BJP, Left, JD-U and Samajwadi Party in the protests against the move. Some slogan-shouting Trinamool members, along with those from the Left, JD(U) and SP, even stormed the Well in the Lok Sabha. With Parliament going into a four-day recess, the two Houses will now meet on 7 December. 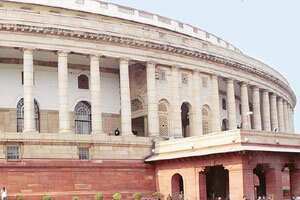 The current session is slated to conclude on 22 December. It was the repeat of the previous days in both Houses as uproar started soon after they met for the day. Both Houses were first adjourned till noon and then for the day. In Lok Sabha, as soon as Speaker Meira Kumar took up the Question Hour, Basudeb Acharia (CPI-M) was on his feet and tried to draw her attention to the FDI issue. He was joined by BJP member Murli Manohar Joshi. Both Acharia and Joshi had given separate notices for adjournment motion to discuss the government decision to allow 51% FDI in multi-brand retail and 100% in single-brand retail. BJP and Left members were on their feet and raised slogans. MPs from Kerala held placards demanding appropriate steps to deal with the Mullaperiyar dam issue. “Safety of Kerala, Water for Tamil Nadu" read the placards. In the Rajya Sabha, unruly scenes were witnessed just as the House met for the day with Opposition demanding rollback of the FDI decision. UPA ally DMK joined the protest along with members from BJP, SP, BSP and others. ‘FDI wapas lo’ and ‘East India Company wapas jao’ (East India Co. Go Back) chanted members belonging to BJP, BSP, AIADMK and SP. Opposition members sprang on their feet the moment chairman Hamid Ansari took his seat. As the slogan shouting opposition members were about to enter the Well, Ansari adjourned the House till noon. When the House re-assembled, similar scenes were witnessed with the entire Opposition raising slogans. In the din, deputy chairman K. Rahman Khan directed laying of papers. As the din continued, he adjourned the House for the day.